Ketta Vaughn founder of Ketta Vaughn Cosmetics and Eve Chen, celebrity make-up artist kicked-off the launch of the new Melange NYC makeup studio on Saturday, August 31st. 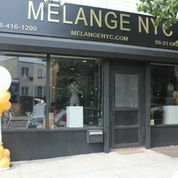 Melange NYC is a full service makeup studio located at 59-23 Grand Avenue in Maspeth, Queens that will offer a professional, customized makeover experience to all who enter the space as well as beauty seminars, lessons, and makeup parties. Guests attending the launch event, including model Tanyka Renee, were treated to a make-over featuring Ketta Vaughn’s new Rock Out Glam collection featuring on trend colors for Fall 2013. Now that summer has come and gone, women can look forward to adding a pop of rich, vibrant colors. Eye shadow palettes will include deep blues such as cobalt and midnight and metallics such as sterling silver and gunmetal to complete a smoky look. Lip shades will be similarly rich and include purple and burgundy. Balance is the key to making these bold colors look natural and women and pair these rich hues with earthy, natural tones and textures. Melange NYC’s makeup artists also provided tips for applying the bolder lip colors for fall. Start by applying a tinted primer. The primer will help lighten the bolder make-up color when applied and also help it adhere better. Next use a pencil liner; smile with a closed mouth and apply with a back and forth motion. This technique makes it easier to create the line rather than one long stroke. Remember, the line doesn’t have to be perfect. Finally, apply the lip gloss. Finish by pressing lips together lightly (don’t roll lips) to ensure even application.